About BeeKind Eco Friendly Wooden Briquettes. High density sawdust and wood chip briquettes the best and economical alternative to fire wood logs or coal. Ideal for stoves and open fires. Who are we ? and why the Bee ? 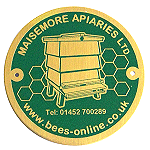 Based in Gloucestershire, Maisemore Apiaries bee hive manufacturers was started some 70 years ago, making bee hives for our own personal use because we are commercial bee farmers. We Keep approx. 1000 hives of bees and produce approx. 20-30 tonnes of honey per year. We now manufacture bee hives for other bee farmers and for anyone who keeps bees as a hobby. Some of our wood waste is collected by local equine centres for horse bedding, then spread onto fields as fertiliser. Due to the high demand for bee hives and bee keeping equipment we are producing an even greater volume of wood waste, this waste is now used to produce our BeeKind wooden briquettes. Please see www.bees-online.co.uk for more information on our range of hives and beekeeping equipment. Our track record shows that the environment and countryside issues matter to us and always has, when you buy wooden briquettes from us you can rest assured that the wood is from renewable, sustainable sources. BeeKind wooden briquettes are ideal for open fires, wood burning and multi burner stoves, they are great for ovens chimeneas and BBQs. To get the best results from your briquettes we reccomend that you use 6-10 briquettes (or one quarter full depending on the size of your stove etc.) on a bed of newspaper, fire lighters or kindling. Light your fire keeping the main airflow of your stove fully open, once the fire is burning well reduce the airflow and leave alone. Compared to logs wood briquettes burn hotter and for longer.